Winter is a natural season for soup-making, but around this time of year, the amount of soup coming from my kitchen gets curtailed. Stews and chills just aren't as appetizing when the weather warms up. This soup is an exception--one that works well with spring vegetables and isn't "heavy." I adapted a recipe I found from Whole Foods by substituting sweet potatoes for Yukon gold potatoes and replacing sour cream with Greek yogurt, which still provides creamy texture but with fewer calories. For prepping the asparagus, I use the simple method of bending the bottom of each spear until it snaps off at a natural breaking point, discarding the tougher end. For cleaning the leeks, I now swear by Melissa Clark's method, which involves cutting the leeks in half through the root (don't cut the root off first), then fanning the layers of the leek under running water to remove any sand and dirt. After that, you can slice off the root end and dark green leaves and chop the remaining white and light green parts. 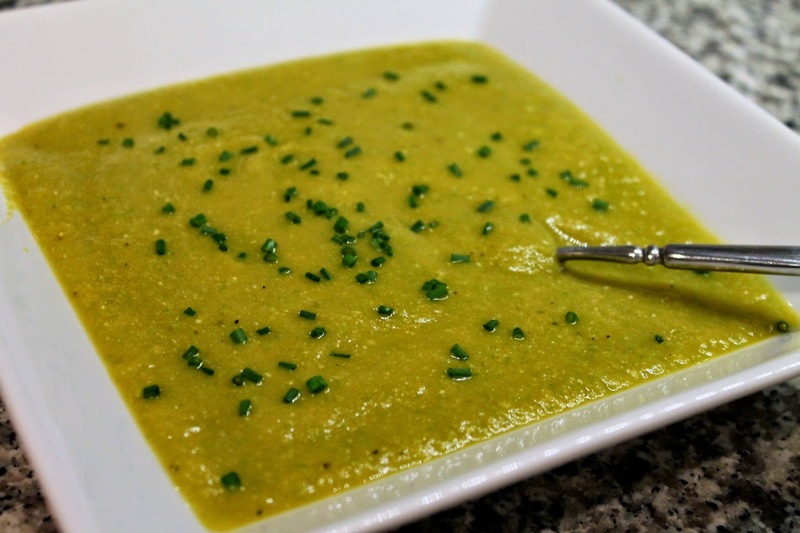 To puree the soup, you can transfer it in batches to a blender or, for a less smooth puree, use a food processor. This is where having an immersion blender really comes in handy though, since you can puree the soup in the pot without having to transfer it to something else. 1. 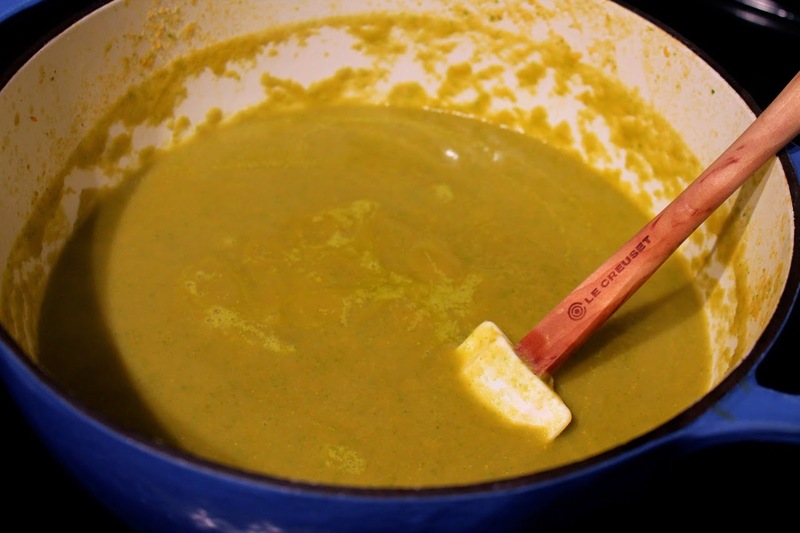 Heat butter and olive oil in a Dutch oven or other soup pot over medium-low heat. Add the leeks and cook, stirring frequently, about 5 minutes. Add potatoes and cook another 5 minutes until the leeks are tender. Add the broth and increase heat to medium-high to bring to a boil. 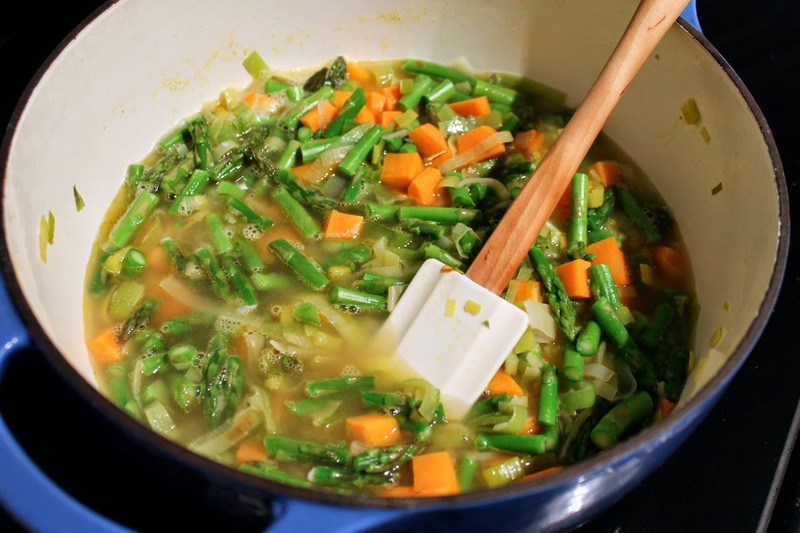 Reduce heat to medium low, add the asparagus and simmer until the vegetables are tender, about 10 to 15 minutes. Turn off the heat. 2. Using an immersion blender, puree the soup until smooth (alternatively, transfer the soup in batches to a blender or food processor--if you do this, you may want to reheat the soup a bit by putting it back in the soup pot over medium heat). Whisk in the Greek yogurt, salt and pepper. Serve in shallow bowls topped with a sprinkle of fresh chives.